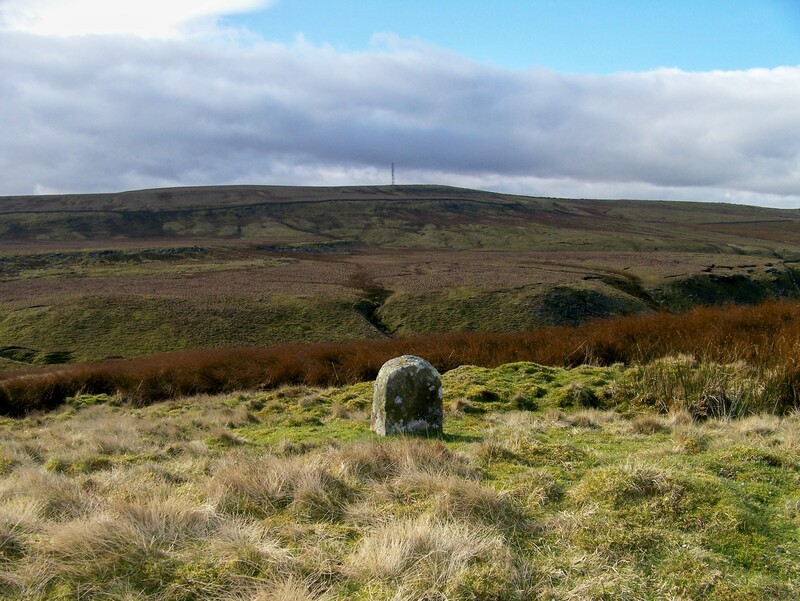 BELDOO Moss is not the most spectacular hill in the north Pennines. Few people have heard of it; even fewer have tramped across it. But it does harbour one or two surprising features that make it worth a visit. I’ve driven over Stainmore between Cumbria and County Durham hundreds of times and got my boots claggy with its peat on several occasions. But I’ve never climbed the high ground – Beldoo Moss – to the north of the summit, which rises in gritstone terraces to a plateau of bog and heather. And up there in that bog and heather, according to my dog-eared map, is a Roman road leading to a Roman fort. This is a bit like Channel 4’s Time Team. I’m on a tight schedule today. I’ve only got a couple of hours before I’m off to work. Will I find what I’m looking for? Will I unearth any fresh mysteries? 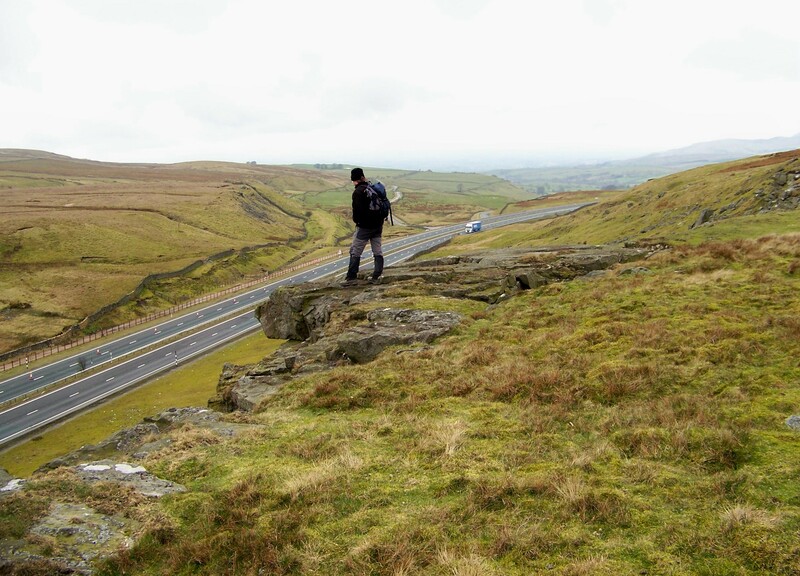 Join me again after the break . . .
. . . I’ve left the car near the A66, rattled through a very conveniently-placed underpass beneath the dual carriageway, and I’m standing on the crest of an escarpment looking down on the Cumbrian landscape and the distant Lake District. I’ve found the Roman road – but there’s something odd about it. It’s much wider than I expected (Roman roads were 8ft wide on straight bits and 16ft on curves) and it’s marked with triangular standing stones every few hundred yards. 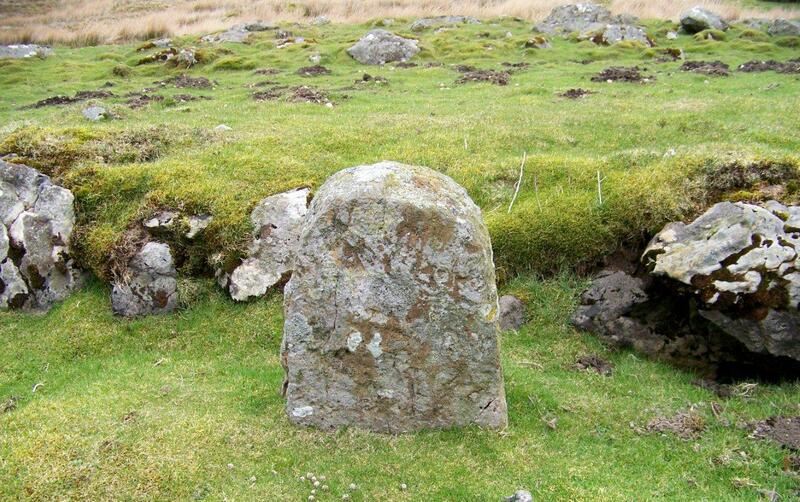 In places the distance between the stones is only a few feet – and they stand up like markers, almost as if they were the bygone equivalent of the metal snow poles on the dual carriageway a couple of hundred feet down the fell. I’ve also found two rounded stones that look remarkably like milestones – and a couple of stone culverts running under the road. And I’ll tell you what else I’ve stumbled across – an inscription carved on a rock, just below the Roman fort. We’ll forget about the fort. 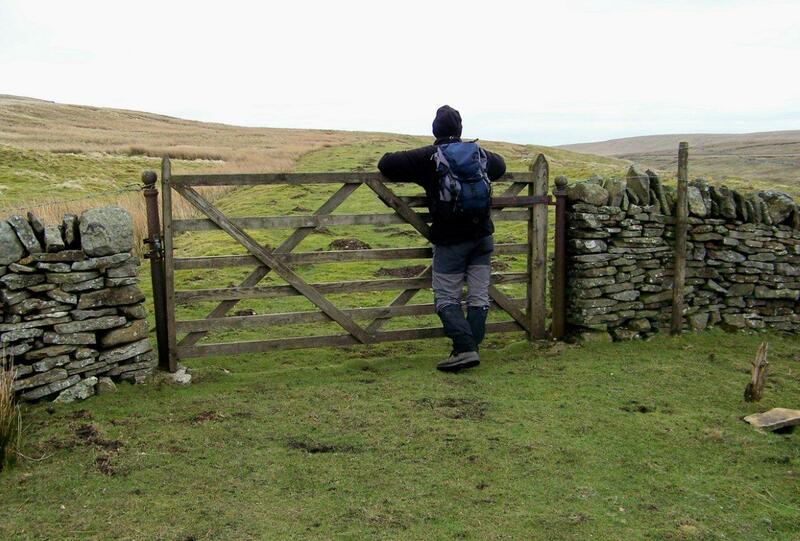 It guarded the Roman road over Stainmore but it’s nothing more than a few humps and a collection of rabbit holes. 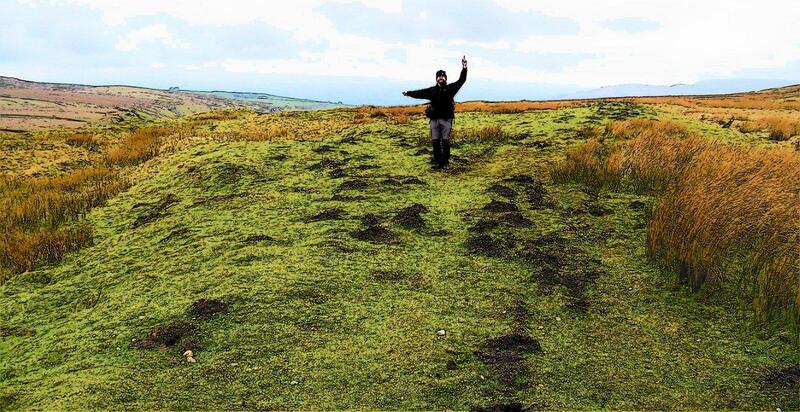 Roman forts are ten a penny in the Pennines. What is far more intriguing is the old road – because an excited voice in my head tells me that this stretch of straight grassy track, with its stone markers, milestones and culverts, is a section of the Brough-Bowes Turnpike that became obsolete when the first tarmac road was built over Stainmore. Alternatively, it could be an even older road that was abandoned when the turnpike was built. I’m not going to argue the toss either way. I’m just glad I’m up here and the sun is shining. What else could it be – a security bollard? 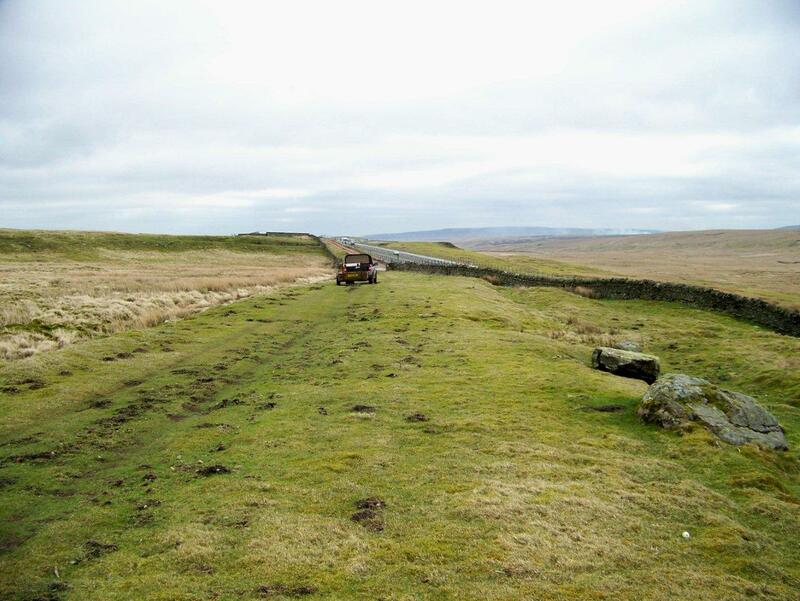 The grassy road runs from just east of Palliard, on the Cumbrian side of the Pennines, over Stainmore summit above the modern A66, to rejoin the dual carriageway at a lay-by just short of the County Durham boundary. Its length is about one-and-a-half miles but there are a couple of offshoots marked by triangular stones or rounded milestones. I count 25 marker stones along the entire length, positioned on either verge; two rounded milestones (no inscription, though a local historian colleague of mine says that originally they would have been painted had they been turnpike milestones), at least one stone culvert, a rock bearing an indecipherable inscription, and three stones placed in a line – which might have had some connection with the Roman fort rather than the road. The road leaves the A66 at this point, just east of Stainmore Summit . . . 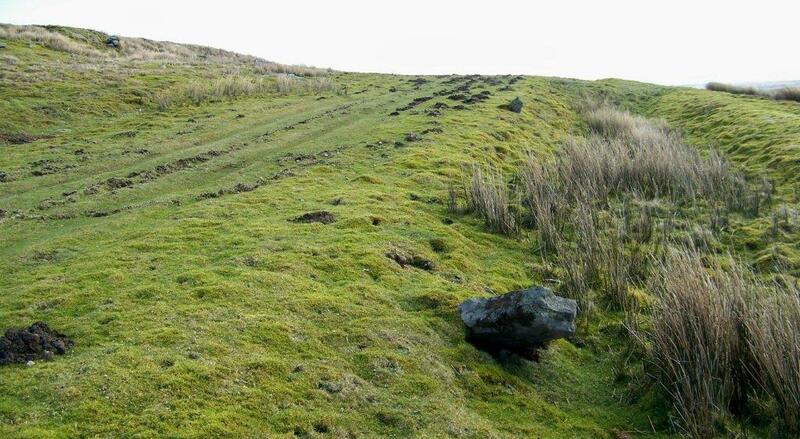 The boggy pass in the Pennines at Stainmore has been used by man since at least Bronze Age times. The cup and ring carvings on Barningham Moor – referred to extensively in other posts on this site – are situated on the eastern side. The Romans engineered the first proper road, presumably, which they guarded with a series of forts, and this was used by travellers, traders, armies and rebellious forces right up to the late mediaeval period. 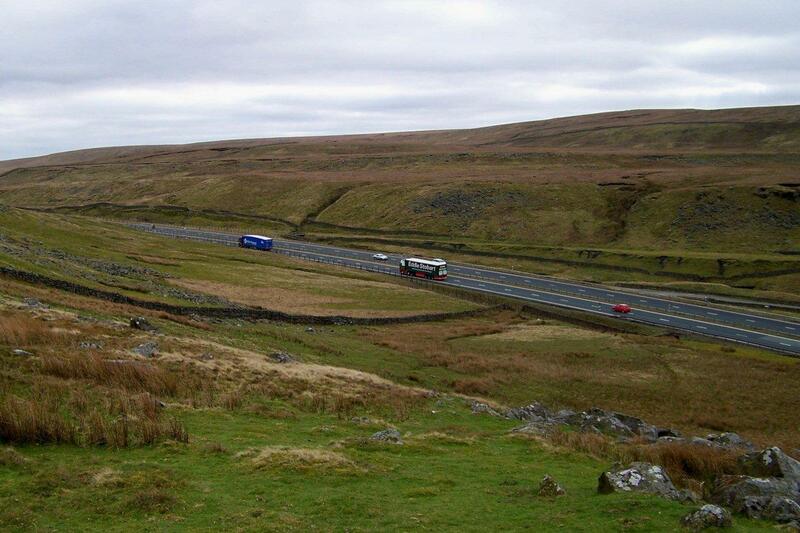 Drovers herding stock to Carlisle and Scotland from Yorkshire referred to the Stainmore route as the Winter Road – the Summer Road being the more direct route up Teesdale and over the tops to Alston. Then in the 17th and 18th centuries came the turnpikes. Turnpike trusts were set up to maintain, improve or build sections of highway to generate trade and boost the economy – and they were given the power to raise capital and charge road-users at tollgates or tollbars. The Great North Road was turnpiked as far north as Newcastle by 1747. Heading west from the Great North Road, from the junction at Scotch Corner towards the Pennines, the section to Greta Bridge and Bowes (now the A66) was turnpiked in 1744, while the Brough-Bowes Trust was inaugurated in 1742 for the 16 miles over Stainmore to Brough in what was then Westmorland. This high section had one tollgate. Incidentally, the last time I mentioned Scotch Corner it prompted one or two comments. It’s a place that has always intrigued me because everyone has heard of Scotch Corner but there is nothing there except a hotel and a road junction. I have since discovered the origins of the name. Travellers heading north to Scotland diverged at this point. 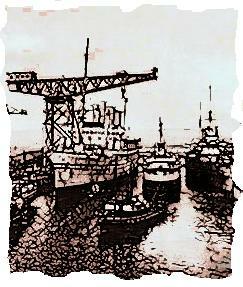 If Jock was going to Glasgow and the west, and Tam to Edinburgh and the east, this is where they parted. Mind, they probably had a pint and a fight first. Not that I’m generalising. A gate across the road. The gateposts are cast iron – much posher than your bog-standard stone stoops. Wonder where they came from . . . So I’m standing on this grassy track with its stone markers and milestones, wondering just what lies beneath my feet. 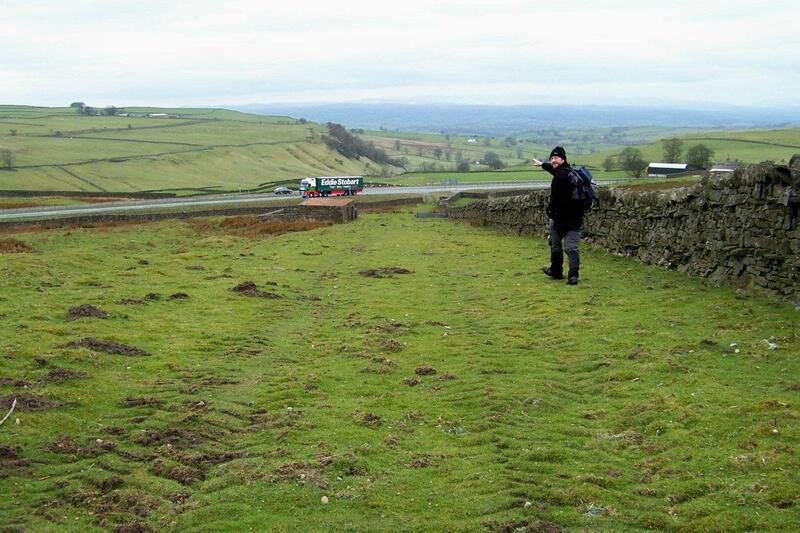 According to one historical source, the turnpike followed the course of the Roman road – so that would explain it – I’m on a section of the Brough-Bowes Turnpike that was abandoned when navvies constructed the first motor-road over Stainmore, most of which was, in turn, buried beneath the new dual carriageway in the 1980s. But I can’t be certain. If anyone has any thoughts on this, please let me know. And another thing, I’ve been singing that Simon and Garfunkel song America all morning and I can’t get it out of my head. That damned line that goes “Counting the cars on the New Jersey Turnpike” set me off. Great song though. And now I’m going to work. Bugger. Or I could get a job directing traffic . . . 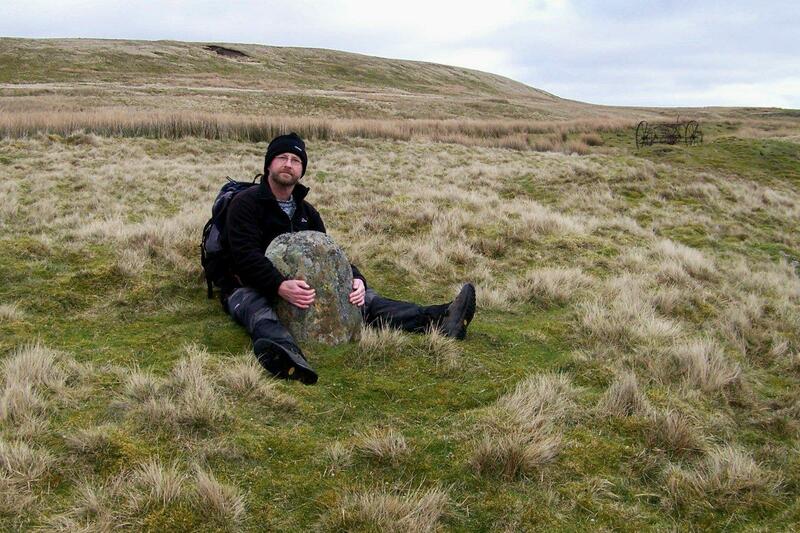 This entry was posted in Archaeology, Bronze Age, Cup and ring carvings, Great North Road, Hiking, History, Mountains, The Romans, Walking and tagged Lake District, outdoors, Pennines, The Lakes. Bookmark the permalink. There’s a carved inscription but I can’t make out what it says. how about :- Timmus Eromniats was ear ! Did he have a cousin called Ludicrus Sextus, or am I thinking of someone else? Very good. That’s the second time you’ve used that and I’ve just worked it out. Do you have shares in Eddie Stobart ? Only joking Alen there appears to be an Eddie lorry in quite a few pictures. Ha ha. 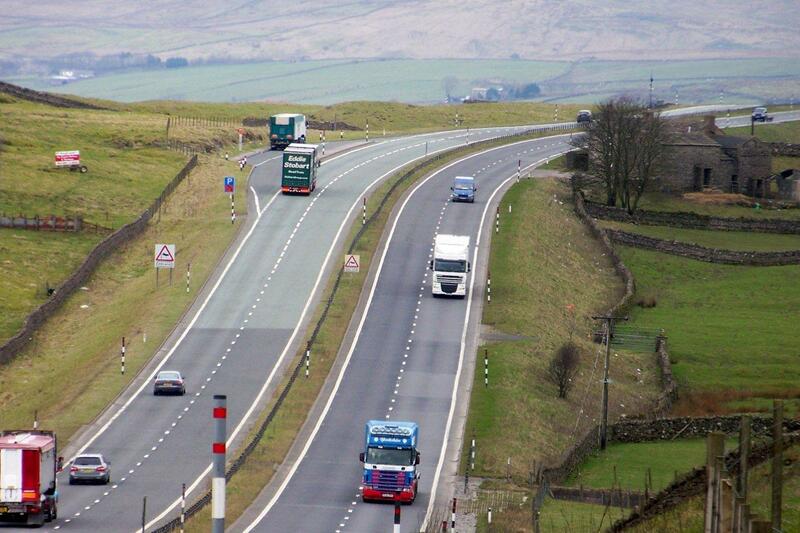 I noticed when I was up there that Eddie lorries were in nearly all the A66 pictures so after that it became a challenge to take one on a timer with me in it. As it happened I got two. Well spotted Greg. I should really give you a prize. Another great read Alen, love the next to last shot with the old Stainmore track bed just above the road. The cast iron post are interesting too – I’m sure I’ve seen these in Lakeland & no doubt I will have a picture somewhere, will have a root about…just wondering, was the gate once part of an private estate at some point? Great post & great pictures as always. ps, you never said you was a secret Stobbart spotter! Hi Paul. It’s hard not to be a Stobart spotter on the A66 because every other lorry is one of his. He must own thousands of them. I don’t think the gate was part of a private estate – but I might be wrong. The posts certainly look a bit too ornamental, considering they are right up on nearly the top of the Pennines. You’ll have me gate-post spotting now. Interesting location Alen, the inscription on the stone is intriguing, shame it has weathered so much. Stainmore certainly has a long history associated with it, didn’t the Viking Eric Bloodaxe end his days a few hundred meters east of your location? As for the gateposts, could they be something to do with the Stainmore railway across the road that have been put to good use by the farmer? Hi David. Yes, apparently Eric Bloodaxe’s grave is supposed to be marked by the stump of Rey Cross, which I mistakenly thought was near or inside the Roman fort. 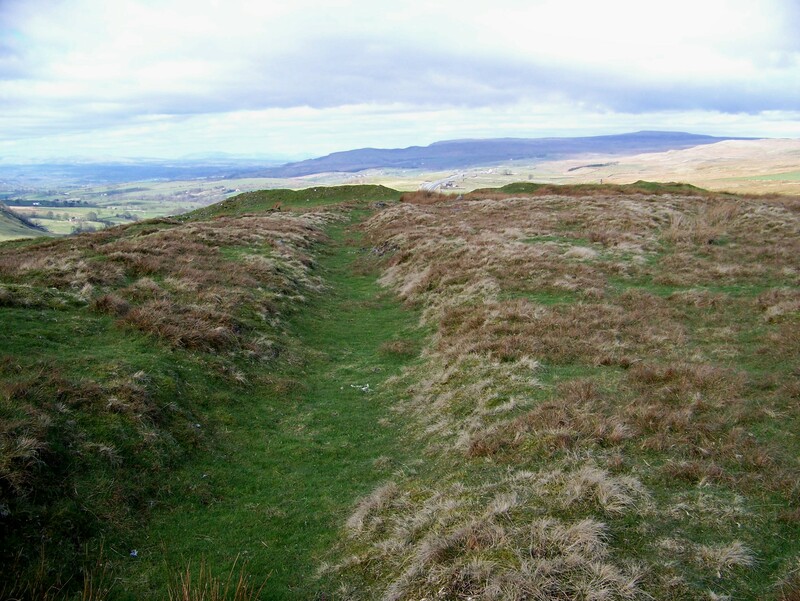 But not having found it, and done some research, I discovered there is a second fort, or camp, right on the the highest point of the A66 where the old road joins the dual carriageway. I haven’t been there yet but I drove past it last night in a horrendous shower and didn’t feel disposed to stop and investigate. I like the idea that the gateposts had something to do with the railway. I always thought Rey Cross marked his grave as well, but an excavation there when the A66 was widened found there wasn’t a burial and the cross was on natural bedrock. http://www.eras.org.uk/erasnews39.pdf. (see page 12) That is not to say he is not up there somewhere though. Thanks for that link, David. Interesting stuff, especially the bit that says the original function of the cross was to mark the 10th Century border between Scotland and England. Also, the excavations that unearthed what is thought to have been a turnpike tollhouse. According the various websites I have looked at, there was only one tollhouse on the entire road, so it would have made sense to put it right on the top of the moor where everybody had to pass. Poor old Erik, though. Up there all alone in an unmarked grave. I was quite disappointed that you’d already received comments about Stobart lorries, it quite took the wind out of sails! Never mind Colin. Chin up. I like that thought, Mark. That you can just step off a road and walk through history. Dunno about the New jersey Turnpike – I’m not even sure where it is. New Jersey? PS: That’s got me humming it again . . . Someone else has already spotted it but I too think the iron posts look like some I’ve seen before when walking along an old railway track….if only I could remember which one……….! Thanks Laura. I’m going to have to check this out and add gatepost-spotting to my spotting list. But that’s what makes the world go round. Great post. 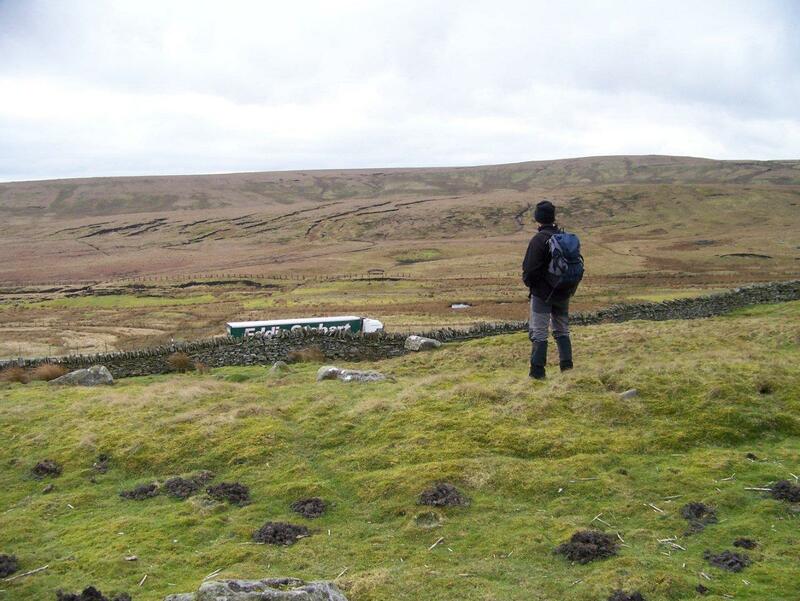 Love the history of the North Pennines. Your own comments and opinions give the narrative great feeling. I’m going to dig your route out on the map. Might even have a wonder. Thanks, it’s great up there. Make sure you pick a good day if you go, though, there’s been some horrendous sleet showers lately. Thanks Danny. I should be driving past it in the next couple of days, So if it isn’t sleeting like it was last time I’ll stop and have a look. Just been up there and found Rey Cross. Going East it’s in the first lay-by after leaving Cumbria. Went looking for it after numerous mentions in a novel by Adrian Rogan called 1314. The same book sent us looking (successfully eventually!) 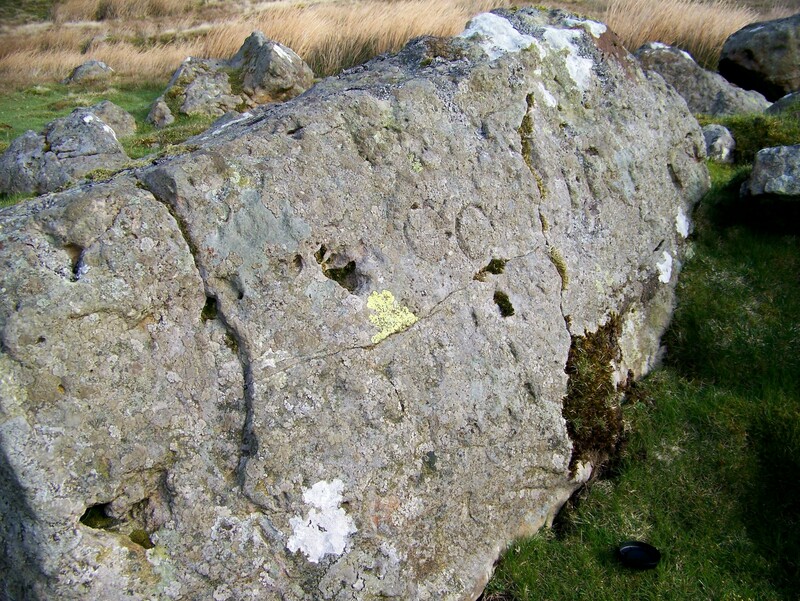 for the Lochmaben Stone on the Solway. Thank you for pinpointing Maiden Castle too … they were all in the thick of it in 1314, post Bannockburn! Thanks for that, Margaret. The Adrian Rogan book is a new one on me and it sounds like something I should read. 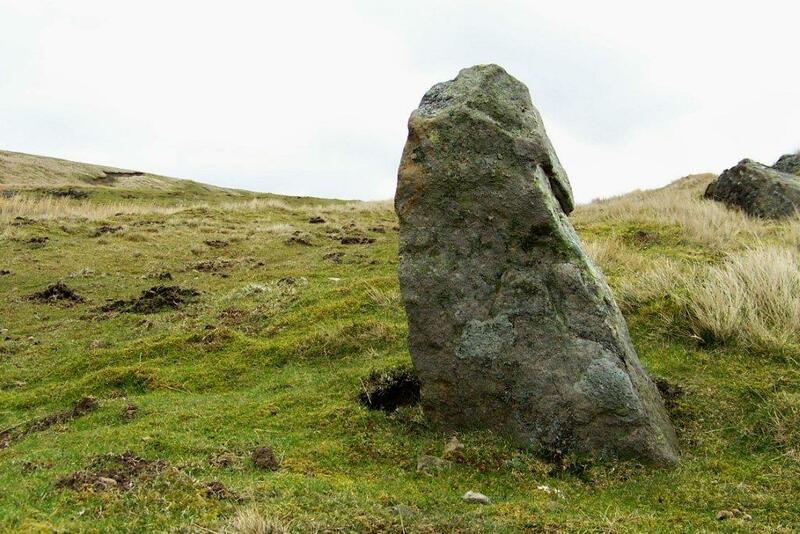 I’d not heard of the Lochmaben Stone either, so I’ve just looked it up on Wikipedia. There’s a stack of history surroundig it. I’ll have to get myself up there sometime.